Back in the middle ages the paradigm was based on scripture. If you could not find it in the bible, it was wrong. 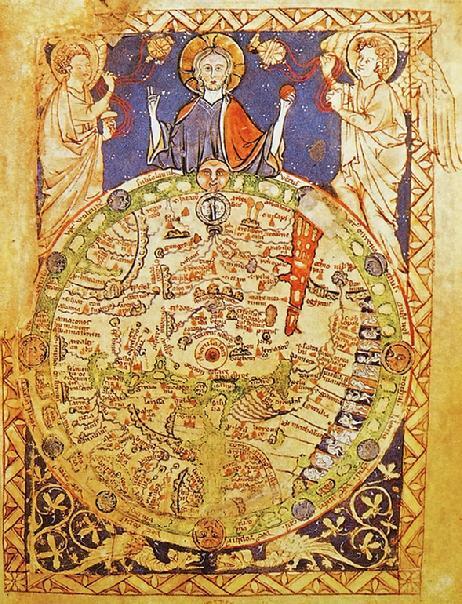 You can actually find old maps based on the bible that have jerusalem in the center with barely any water, because thats what the bible said (for an image: http://www.edgeofenclosure.org/images/462_medieval-mapJerusalemCenterC1250.jpg) . Now, this is literally wrong, you can use your eyes to figure this out. Same with the heliocentric universe, this is true, however you would have been condemned to believe otherwise. The church ruled for like 1000 years. You were raised using scripture to explain everything. Anything that was counter to it was not fathomable. Take a look at Flatland, its kind of like that: They are all circles in a 2d world. Trying to say that a 3d sphere (science) really exists did not make any sense. Eventually scientists poked holes into this view on the world to where science became the new paradigm. Currently we are still in the science paradigm. Its based on mathematics. Now math and numbers are theoretical and man-made construct (dolphins dont ‘count’). You could say that they are the equivalent to gospel and scripture: the basis of the paradigm. Science has improved our life in many ways, and we need to have gone through this paradigm to get to where we are headed. But there are holes being poked into our paradigm. Quantum theory is starting to prove things that science said were impossible. This theory, however, is still based on mathematics (hopefully meaning that we’re on the right path) and uses it to prove its theory. The ideas of multiverses, time travel, and the same atom being in two places at once (which could explain the existance of separate consciousness or ‘the soul’) are now theoretically possible. Now eventually this may be proved wrong based on something completely different. But why must we cut eachother down on ideas that may be disproven in the future. Let the scientist believe what they want, the religious what they want, and whatever future theorists say. On a side note about the bible and probably other relgious texts as well. It was written by MAN, a inherently flawed creature. Now christians (or other religions) believe that its God’s word, however, man assembled it. The catholic church actually has taken out alot of chapters (apocraphal texts), and what was put in the bible was decided by men in power. Food for thought. Just everyone stop fighting.